Google Adwords is an advertising platform that can send very targeted people to your website if they search for the phrase you are advertising on.Google Adwords also has a Content Network, which allows you to advertise on other websites based on the presence of the phrase within the page. 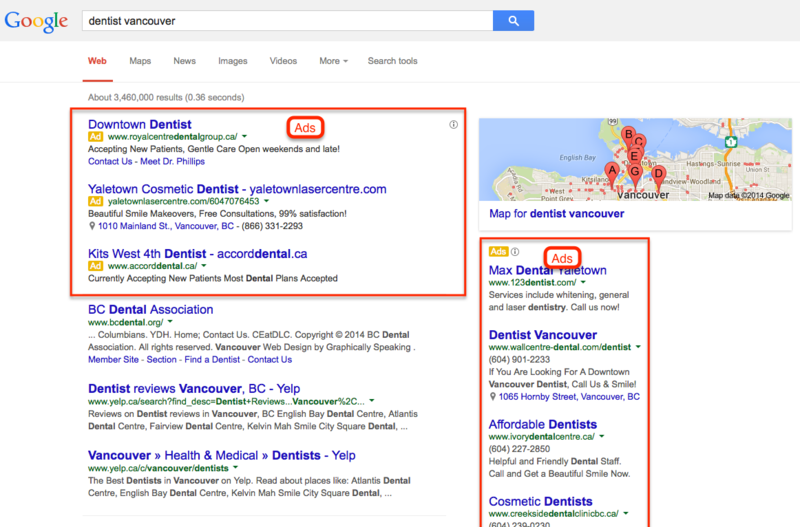 This is an example of a search ad set for the phrase "dentist vancouver", displayed in the Google search result. In general, the top ad in the main section will get most searchers clicking on it, followed by the second ad from the top, and so on. Ads on the bottom of the page will typically get the fewest clicks. Setting up and managing Google Adwords campaigns can be very complex, and without doing it the right way, can end up losing you money fast. Fortunately, if set up and managed right, Google Adwords can be the most effective and highest return on investment advertising channel in your business. We offer full setup and management of Google Adwords, freeing you to get on with what you're best at, and taking the learning curve and complexity out of trying to do it yourself. For more information or to get started, call 1-877-752-0852 today. By now you have probably realized how tricky it can be to get the results you want from Google Adwords. Perhaps you lost money without ever getting in back. It's not your fault. Google Adwords is a very complex advertising platform, which unwittingly punishes people that have not learned the intricacies of the platform and how to set it up and manage it right. Done right, Google Adwords can be your most effective and highest ROI advertising channel. We would like to help you get and stay in that position. We offer setup and management of your Google Adwords campaigns. To learn more or to get started, call 1-877-752-0852 today.